Are 3D printers in schools a misguided fad? Is full inclusion a good idea for our students and culture? Are design kits (think Arduino or Lego Mindstorms) a deviation from the core science we want so badly to improve? These are just a few of the ideas we discussed in this wonderful afternoon. Enjoy. My friend Dan recently took a job working at Tuft’s Center for Engineering Education and Outreach. In his last weeks at High Tech High he invited me to visit his new digs and offered me a place to stay. Unwilling to indulge in a truly work-free vacation, I injected this delightful detour into my already planned trip to New York. In preparation for my time in New England, I also reached out to our CEO Larry Rosenstock who was kind enough to put me in touch with a few folks at the MIT Media Lab (which I had been intrigued with for some time). When I arrived to my 10am appointment in front of the MIT Press Bookstore, my plan was to get a few ideas about fabrication equipment and to see their lab space. I would have been happy to get 30 minutes of my hosts time. Four and a half hours later, after talking shop, pedagodgy, and cultural philosophy, I walked away beaming with new ideas and questions and tried to write down as much as possible before it osmosed its way out of my head. I spent the afternoon with three gentleman. One of the gentleman (who elected to stay anonymous) is a visiting scientist and lecturer at MIT and the director of multiple engineering, education, and outreach groups. Eric Rosenbaum is a doctoral student in the media lab’s Lifelong Kindergarten Group and the co-inventor of Makey Makey (which is now commercially available). Projects – We explored and talked about a number of interesting projects. SCRATCH – SCRATCH is a web-based, block programming tool centered around visual and auditory interactions. It has been developed over nearly a decade and is now publicly available. What stood out to me about this tool is its intuitive user interface and it’s ability to provide instant feedback. Unlike embedded systems, which often require more experience to run, test, and operate, this tool provides instant feedback making it the perfect tool for introductory programming. Makey Makey – After marveling at an 8 year-old girl playing Beethoven on a bannana piano at Maker Fair last May, I got to meet the co-inventor of this new gadget. Makey Makey is a plug-and-play interface that lets you make almost anything (a bananna, playdough, or your sweethearts lips) into a switch that acts as a mouse or keyboard input to your computer. HTH Projects – We actually talked a fair amount about my previous projects, where I got parts, how I scaffolded them, how physics was involved, etc. Specifically, Apocalypto, Seniors2, and Piracy Based Learning. Experimental Play – During a demo of the Makey Makey, Eric shared an interesting event. For context, The Makey Makey is triggered by completing a circuit. Whether it’s the Makey Makey to you to a banana and back to the Makey Makey or a piece of foil across two contacts, it needs that complete circuit to trigger an event. However, while holding only one lead, jumping into the air will sometimes trigger an event. While contemplating the potential reasons for that, we discovered that if I jump – nothing happens. Only their jumps triggered anything. We spent the next 5 minutes swapping shoes, standing on one foot, and jumping around in an attempt to form a valid hypothesis. Although we left still baffled, it was a great example of what I want my classroom to look like. I want students to run into problems that they are then motivated to find a solution to. Cool Shares – We shared a few common fascinations during the discussion, including: MechaniCards, Disney Research’s new Software Computational Design of Mechanical Characters, and Ralph Steiner’s Mechanical Principles video. Research/Resources – Throughout our conversations there were some recurring themes. There are two authors that I need to investigate – David Hawkins & Steven Johnson. I also need to look in the programming language Processing as a potential (PC based) controller for my upcoming assembly line project. Fabrication Technologies (Fab Labs) – One of the gentleman had done some research around Fab Labs around the turn of the century (before it was cool) so had a lot of experience on this topic. All involved were also tinkerers and had personal experience with many common tools and equipment. 3d Printing (common extrusion based printers) – While a fantastic tool for low quantity or custom production in a design setting, it may not be a great fit for a classroom fab lab. They add an additional, but surmountable, challenge by requiring 3D CAD use on the front end and a general feel for creating 3D geometry. Also, my own user research (which by this point is well past anecdotal) has presented a common response – “It’s great … but I still have to fix it”. There is a lot of down-time on this device for novice and expert users alike. This presents a nightmare for a classroom full of students trying to meet a deadline (or a teacher trying to get home at a reasonable hour). Lastly, and most importantly, the print time is not conducive to iterative design. Even when operating smoothly, a small object (the size of a usb stick or a pencil) can take multiple hours to print. Given a perfectly operating machine, two sections of 30 students, project groups of 5 students, and the optimistic 3 iteration cycles, even a small project could result in print times well in excess of 36 hours. Scale that to reality and it’s a terrifying obstacle. These printers, like the popular MakerBot, don’t seem ready for novice use in a classroom setting. Subtractive Methods (tabletop 3d mills) – This option raised interest but the CAM versions the group had experience with were too finicky for any volume production. This deserves more research as it is theoretically capable of processing very diverse materials (plastics, woods, metals, etc.) and CAM support software is increasingly user friendly. We also discussed the intermediate possibility of hand operated desktop machining equipment w/ DRO. It removes the computer as the obstacle, has the potential for more spatial thinking, discovery, and hands-on experience for students, and is much less expensive. Examples: Micro Lathe, Micro Mill. Laser Cutters – A definite crowd favorite. Simple to operate, safe, reliable. There were more laser cut projects around the media lab than anything else. We did, however, discuss how it significantly abstracts the manufacturing process. You put something in – something pops out. It increases the quality and efficiency or fabrication but has the potential to remove part of the learning if not approached carefully. They had lots of questions for me about how ours is being used and who is using it. General Fabrication Equipment – When selecting equipment, being mindful of long-term costs – financially and otherwise. How realistic is it to integrate the device into development in a classroom? Will this device be closeted if a teacher leaves the school? An example of a more expensive but higher value (faster printing) 3D printer here. What I expected to be solely very nuts n’ bolts day turned out to be as much about philosophy and vision as it was fabrication. Our conversations covered a lot of ground and the topics below represent my take on the topics. These are by no means the views of the other gentleman nor do I pretend to speak on anyone elses behalf. The Black Box – Most science and engineering depends on an inconceivable bed of abstraction. In fact, our world is full of ‘black boxes’ where we provide an input and expect an output without any understanding of the magic that happens in between. However, in Science and Engineering education, we need to remove at least some of that abstraction. That’s where the learning happens. We spent a great deal of time wondering if the current market of kits has crossed that threshold into a point where the learning has been compromised. Developing Attitudes – Needless to say, some people don’t like science and engineering. Whether it be a result of preconceived competence or just a plain lack of interest – many students require an attitude shift before any learning can happen. Highly abstracted kits do a great job of building confidence and generating interest. We also discussed the potential to create a false sense of competence. After building a robot with Lego Mindstorms, a student may encounter a seemingly comparable challenge using another medium and find themselves wholly unprepared. Though very speculative, this has the potential to break any confidence that came out of the initial project and illustrates the need for explicit context in student projects. Developing Skills –Although any measure of skill development is dependent on the targeted competencies, increased abstraction means that students have less access to a great deal of the real science and engineering. Most of the problems have already been foreseen and solved for them. Sans Abstraction – Throughout the kit conversation was the common theme of “but what about the content?” A group of seemingly radical educators had a very real fear that we may be losing something as a result of the education policy about-face. Can there be real innovation without a deep understanding of core principles? Project based learning has a promising track record with skill building and focused content but is that enough? Are kits and platforms providing the cognitive infrastructure for students to build on? With very explicit and well-planned scaffolding, I think it’s possible to use these new tools and techniques effectively. But with varying experiences for every student and skill sets for every teacher – it’s going to take a more than a ‘my classroom’ perspective. The Classics – At one point, someone made a reference to a hard-line liberal arts professor that refuses to give up his shakespeare. In his mind, Shakespeare is an indispensable resource – a core principle – that all students should be familiar with and read first hand. Direct exposure and discussion. No abstractions. In science, maybe shakespeare is a traditional textbook. Maybe shakespeare is a study and reproduction of groundbreaking experiments performed by historically significant scientists. If so, is our educational innovation displacing Shakespeare? Then What – We also talked about a trend taking place with kits and fab labs. Fab Labs have been placed throughout the world for students and the public to fabricate their own stuff. And fabricate they have. However, fab labs may not be the innovation hub many had hoped for. People may download and 3d Print an object they found online – but it’s less common to design a unique object to fabricate. The same thing happens with kits – people finish putting together an example procedure or tutorial …. then aren’t sure what to do. Is this a reason to stop building fab labs and kits? No. But it may constitute a shift in focus and remind us that hardware and equipment is nice – but it’s hardly the principle cause of innovation. Scaling the change – We also talked about how to promote and sustain change on a larger scale. We talked in reference to the High Tech High model as well as education in general and our conversation kept coming back to the unique characteristics of an individual as the requisite for success. Whether it be an administrator that maintains a strong culture or a great teacher, each bright spot was a result of talented, skillful, reflective practitioners. It’s the job of policy makers and administrators to identify, secure, and nurture individuals with the skills they need. Even more importantly, they’re responsible for supporting and training – or replacing! – struggling teachers. This management of personnel resources is a pet peeve of mine – lots more on this here. Teacher Training – We also touched on teacher training which is a vital piece of the puzzle if we are going to make any significant change in the status quo. Although we agreed that traditional training (i.e. classroom management techniques) is important, we also discussed two other factors. First is hiring good people. You can’t expect greatness from someone without ensuring they have a few core competencies. Teachers should be driven, communicative, and reflective. For a project based school they also need to already be a producer! It doesn’t matter if they write poetry, build cars, sculpt, draw, build robots, or participate in theater – they just need to enjoy (and be active in) creating some sort of product in their everyday life. When training existing teachers to work in a project based setting there should be two foci. First, explicitly teach production skills. Many teachers are scared to transition to projects because they have no basis or experience in making things. Teach how to use Adobe products, how to use a chop saw, or how to publish a book online. Second, train teachers in a project based setting and teach by example. Immerse teachers, as a student, into a project with very real expectations and deliverables. At the conclusion of each day (or teaching event) the facilitator can then explicitly deconstruct the day from their perspective as the facilitator. They can introduce and lead a discussion on the pedagogy they employed, the judgement calls they made, and the things they could have done better. This deconstruction should be an explicitly separate exercise from the project itself and should occur on the same day to ensure relevance. Having been through this kind of immersion, teachers would have the confidence to try their own product or even to just reproduce the one they just experienced in their own classroom. High Tech High’s Methods course for new teachers is a great example of how this may look. Is our society heading towards being one-sided? Is it any surprise that educators and engineers think that more students should learn to love and understand engineering? Is this whole fad just an egocentric projection of the people in charge? By shifting away from standardization and exclusion (think gate or special education), we seem to be spending a lot of time trying to make students more unique. Yet, by vocalizing engineering minded learning goals over the rest of education, are we really just trying to force everyone to be the same? 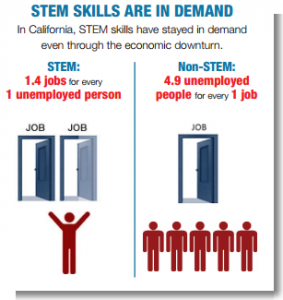 Maybe we should be moving towards the vocational model and letting them pick their path? All in all, we shared in a very healthy moment of self doubt. This whole afternoon was mind blowing for me, for a few reasons. First, I felt like my self-doubt was validated. I left convinced that I am asking the right questions and judging myself by the right criteria. The most surprising thing to me though was that I felt like I had something meaningful to contribute to the conversation on education in the company of this MIT talent trio. That made me feel good. I also further enforced my frustration that most of my most burning questions do not have a right answer – ugh. And lastly, with names like Makey Makey, BlockyTalky, Kismet, and PostStitch (a textile based play on PostScript) – it’s hard to believe that MIT doesn’t have a course on making cute product names. On my way into the back room, I was greeted by a proximity-sensitive bird marionette that squawked and danced to announce my arrival. The back room was full of students working on summer projects including a scratch-built vending machine for electronic parts, programming of an industrial articulated robot named BAXTER, 3D printing of a BAXTER operable pipette adapter, research on fab lab equipment recommendations, an oldy disturbing NAO Robot sleeping in a duffle bag, and a labview based compiler that would allow students to program multiple devices through a single language. I spent the most time talking with Quinn, the president of the Tufts robotics club, who helped me to understand the design of his vending machine (which had similar mechanical needs to my upcoming assembly line project) and who gave me a tour of the robotic clubs workshop. Overall a neat experience and I feel that I came out with some very tangible ideas (not to mention some great resources). My conversation about programming with Joe had started an interesting thought process for me and I am very interested to explore block based programming as a scaffold for (or replacement of ) traditional programming in my class. As I weathered an unexpected rainstorm in a local ice cream shop, I did some research and discovered a variation on this open-source platform called BlocklyDuino which can be used for programming Arduinos. I found that it is fully customizable and within the hour I had the program hosted on my DP. I intend to use this in my upcoming project and am very eager to see how students do. As much as I enjoyed my visit, I was a bit saddened by the disparity between theiraccess to materials and resources and mine. While some of their materials and tools seemed excessive, each student had a not-insignificant program funded budget to work with and it showed in the quality of their selected parts and resources. BlockyTalky – With his product well into testing, lego robots can now communicate wirelessly with other lego robots over the internet. A robot that bumps a wall in San Diego could cause a robot in Tokyo to say “Ouch – my twin brother just hit a wall.” With the ability to record use data – his developments also present an interesting opportunity for studying how people use this type of device. Preliminary demo here. Electronic Components Vending Machine – Engineers have a tendency to work on projects well into the night and many have felt a need for access to parts on a 24 hour basis. This dispenser of electronic components is being built, from scratch, to serve that need. BAXTER – BAXTER was developed as a human-friendly industrial robot meaning that it is safe to have him working alongside people on an assembly line. He is aware of his surroundings and has a soft touch. They were working on training him/it/her to open a specimen jar and operate a pipette to take samples. The intent is to liberate human employees from this mundane and carpal-destroying job. LabVIEW Education Edition – Many techonological tools being used by educators require the acquisition of a completely new programming language. A student may program a Raspberry Pi in Python, an Arduino in C, and another device in LabVIEW. This project aims to allow a common development environment to be used with multiple platforms. Project site. After my Tufts visit on Monday, I took Dan’s advice and visited the MIT Museum. My exploration through the ground floor was a bit disapointing (other than a neat slide rule exhibit) but once I discovered the second floor – I was in hog heaven. While all of the exhibits were neat, two really caught my attention. My favorite exhibit was Gestural Engineering: The Sculpture of Arthur Ganson. About two years ago, Larry gave me a DVD of this guys work which I was fascinated with. Seeing it in person though was a whole different ball game. I obsessed over each and every piece – watching it go through the motions over and over again until I was confident that I had gleaned everything I could from it. All except for one – Corey’s Yellow Chair. I never could nail down exactly how it actuated the quick-return and hold. I spent a while sneaking peeks at the back of it and was surprised to find electronic and magnetic components – yet never did figure it out completely. The entire style and medium of the art fascinated me. It used very simple materials to achieve relatively complicated outcomes and made me wonder if my constant desire for better quality materials and tools is a copout. I also spent a while in the Robots & Beyond exhibit. While interesting and complex, many of the robots were pretty old (circa 1995 – 2005). I was most fascinated with their material selection and design choices. One thing that really fascinated me was the near universal use of this mechanical interface for controlling joint articulation. A motor shaft is threaded and a fine cable is wrapped through the threading as a kind of friction pulley. The cable is then used to rotate a cam or pulley to acheive the desired articulation. I really want to know what this is called and why they choose it for nearly all of their robotics. All in all, the museum was great. After my visit I discovered that there were additional off-site exhibits and I wish I had known about them before I left Cambridge!